Shirts With Random Triangles: Braxton Miller to switch positions from QB to wide receiver. 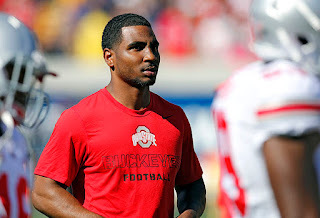 Braxton Miller to switch positions from QB to wide receiver. Braxton Miller. Image via The Columbus Dispatch. It looks like the ongoing quarterback controversy at Oho State just got a little less complicated. Braxton Miller has reportedly made the decision to switch positions from QB to wide receiver. According to SI.com's Pete Thamel, Miller first discussed switching positions in the spring; speaking first to Buckeye strength and conditioning coach Mickey Marotti, then to head coach Urban Meyer. Thamel says the idea was intended as "a fallback plan in case he couldn’t return fully healthy to playing quarterback after two shoulder surgeries." He began watching film of other wide receivers, and worked out in secret catching balls thrown by fellow Buckeye QB J.T. Barrett. Miller and Barrett were expected to compete for the starting QB job with Cardale Jones, who led the Buckeyes to the inaugural College Football Playoff title in the wake of the later QBs' injuries. In an interview, Miller said he expects to be used in a H-Back role, which is described as "a hybrid receiver position." Miller's move to WR is probably a smart one going forward. The two shoulder surgeries would probably be red flags for NFL scouts when it came to the QB position. If the transition is successful, Miller could see his 2016 NFL Draft stock rise.